As I just discovered my cover and blurb today and am so thrilled! Desperate to escape her murderous brother-in-law and protect her young sister, Ragnhild agrees to marry an unknown warrior, and arrives penniless at his remote island. Only Gunnar Olafson’s belief in love died with his family—he does not want a bride! But as yuletide approaches Ragnhild transforms his isolated existence. 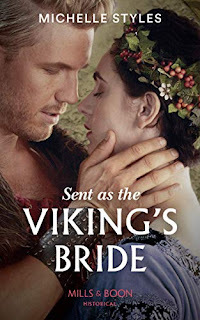 Can she melt her Viking warrior’s frozen heart? To be published 27 December 2018.